Happy Halloween! 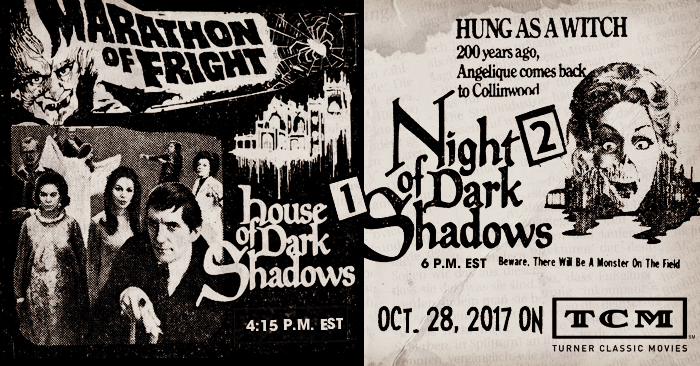 On Oct. 28, Turner Classic Movies will air 1970's HOUSE OF DARK SHADOWS and 1971's NIGHT OF DARK SHADOWS back to back. This marks the first time in many years that either film has been shown on TCM at any time other than the wee hours of the morning, so maybe folks will get to see it this time. HOUSE begins at 4:15 p.m. EST, with NIGHT following at 6 p.m. Even better, Oct. 28 is a Saturday, greatly boosting out chances to turn this into a Twitter event that day. Stay tuned for details.